Mediaite has news of a…gentleman’s agreement between FOX News darlings Bill O’Reilly and Glenn Beck. Apparently O’Reilly doesn’t have high hopes for Beck’s much-hyped 8/28 Restoring Honor rally, as he predicted the turnout would be in the lower five digits. Beck disagreed, saying he’s hoping for 100,000+. O’Reilly promised him if he made it so, he’d hand over his coveted 8pm time slot so that Beck could host “The O’Reilly Factor”. Well, this just got interesting! See the video here. Geekosystem has an interesting take on the influence of superheroes, from psychologist Sharon Lamb. Dr. Lamb argues that today’s superheroes are more like action heroes — with all the drinking, violence and lady troubles that implies. But is there a difference between the virtuous superheroes of yore (whose existence is debatable at best) and the heroes that appear in contemporary movies marketed to adults? Susana Polo thoughtfully breaks it down, noting “While the superhero genre has well established tropes and rules, any genre can accommodate tonal shifts.” Read the full post here. On Styleite today: “America’s Next Top Model,” now on its three billionth cycle, is shaking up its format. The winner of this cycle will no longer appear in Seventeen magazine, but will instead grace the cover of Vogue Italia — a much larger coup in the modeling world. Additionally, the show is importing guest judges who have, you know, actual pull in the fashion industry. Roberto Cavalli, Zac Posen, and Vogue Italia’s editor Franca Sozzani are all slated to make appearances. But with so few of the Top Model alums being able to boast of genuine success, will all these industry insiders help to produce a winner who will have a legitimate career in modeling? Guess we’ll have to wait and see when the show premieres. Until then, get the full post here. Ah, regional politics. 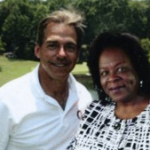 Sportsgrid brings us the truly bizarre story of Dorothy Davidson, who is running for mayor of Bessemer, Alabama. Davidson apparently tried to curry favor with voters by including a photo of her standing chummily next to beloved Alabama football coach Nick Saban. 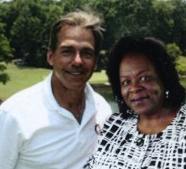 The only problem is, Saban was never contacted for an endorsement — and the original image shows him standing in the same idyllic lakeside scene…with his wife. Oh, dear. For the full post, and to see some really appalling Photoshop, click here. 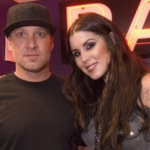 In today’s edition of “They Deserve Each Other,” Gossip Cop reports that tattoo artist and reality TV personality Kat Von D is dating notorious cheater and ex-husband of Sandra Bullock, Jesse James. Von D posted about their relationship on her Twitter feed, then thought better of it and deleted it, but she confirmed they were dating again during an interview with an LA radio show. She claims that his checkered past doesn’t bother her, and that James, like everyone else, is capable of making mistakes. Sure, but mistakes that lead to multiple mistresses and a very public divorce? Von D doesn’t seem worried, saying she has “a lot of respect” for James. Oh boy. Read the full post here.